ikat bag: Menagerie For Sale! I am happy to announce that you can now - finally - buy Menagerie! 1 This post tells you what's inside Menagerie, how to use it, and what sort of skills and materials you will need for the projects. 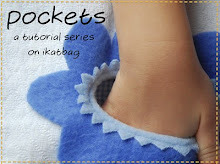 2 This post has a free download sheet of hand stitches that are used in the projects of Menagerie, and which are useful for sewing soft toy in general. 3 This post introduces you to some of the tools that I have found useful when sewing soft toys and dolls, including a home-made funnel for channeling poly beads into small and deep spaces. 4 This post contains FAQs and background about Menagerie. 5 This post documents the thoughts and sewing experience of my stupendous pattern tester Grandma G (thank you, Amazing One!) as she ploughed through Menagerie and test-sewed the kangaroo and joey. Lots of photos! 1 The file is about 13 MB. Make sure your device is able to both download the file and store it before opening the file. 2 This is a pdf pattern. I repeat: this is a pdf pattern. This means that it is not a paper pattern. It will not be delivered to you in your postbox by the mailman or the UPS guy. It will come to you via a link in an email. You will need to download it yourself, open it and print it (if you want). You will need a program that reads pdf patterns in order to open it. Adobe is an example. Preview on the iMac is another example. Microsoft Word is a non-example. WatsApp (or Twitter or Facebook) is another non-example. 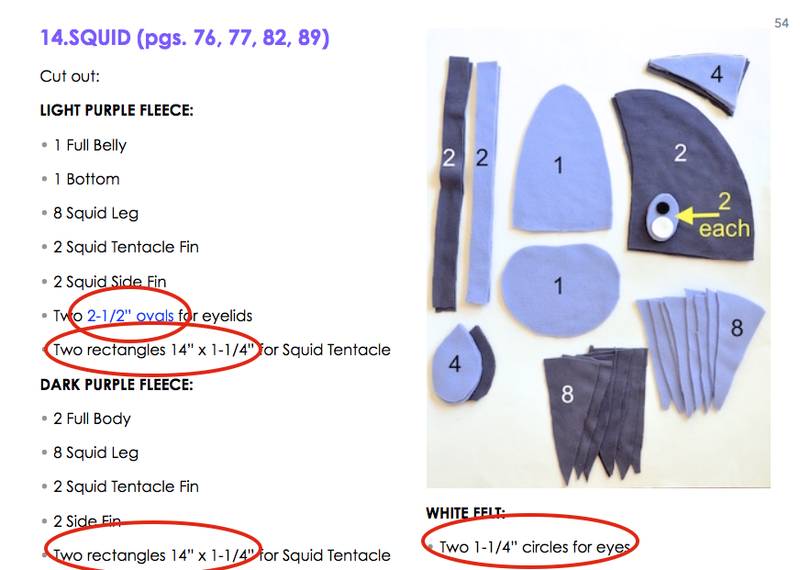 3 The templates (there are 14 pages of them) have NO SEAM ALLOWANCES. This is to enable you to enlarge and shrink them more easily to make animals of different sizes. It is also to enable you to easily assemble the integrated tails and modify the base template to do different things and make different animals. Some people will prefer having SA included in the templates. To that, I say, "Tough." I also say, "Learn to lay out without included SA because once you get used to it, you will experience a liberation like no other and you will never look back; among other things, it allows you to accurately mark sewing points and lines and match up edges. But if you still prefer, you can turn the SA-less templates into SA-included ones by cutting them out with a 1/4" border (my kids call it "bubble cutting") around the relevant edges, before laying them out on the fabric." 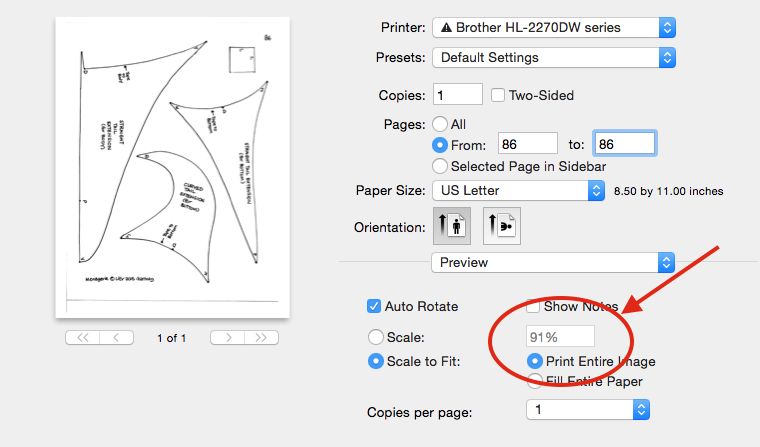 4 When you print out the template pages, make sure to set your printer to print at 100%. This is what my printer menu looks like when I command it to print a page - it chooses 91% because it thinks it's clever. I override it and set it to 100%. Notice that the image is now bigger. Also notice the square in the top right hand corner of the image - this is a 1" callibration square. If your page is printed at 100%, that square will measure 1". 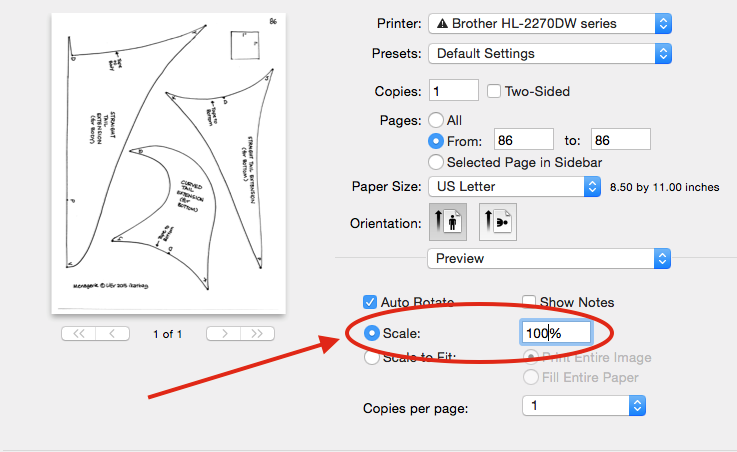 Your printer menu will not look the same as mine if your printer is different, but they can all be set to print at 100%. If you are using shrunken templates, these other pieces might be a tad large and would need to be cut proportionally smaller, too. Moral of the story: don't let your printer tell you what to do; show it who's boss and make it print the right size. 5 Menagerie costs US$24. Originally, I wanted to price it at US$50,000 to reflect the amount of work that went to it, but talked myself out of it. You're welcome for the 99.952% discount. Email me or leave comments if you have any questions, or if you have problems with the download, okay? We're going to be at some lake (i.e. no internet connection) for the Independence Day hols, but I'll be back at my computer after the weekend to help you all out. Alright, enough talk. Go here to buy the pattern, and thank you for all your support and interest! 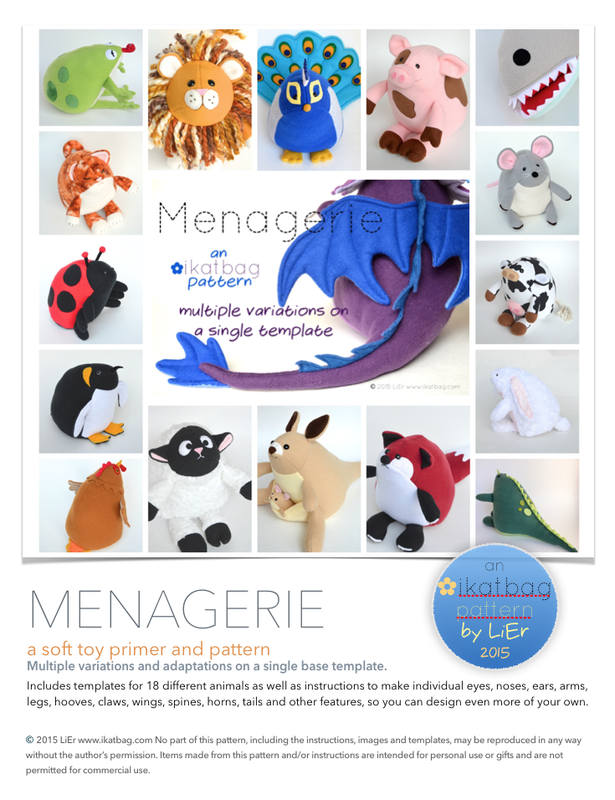 I hope you enjoy sewing the animals of Menagerie and learning to create your own. Go forth and fill the earth! Although I have to say, I'll probably wait a while before I starting sewing this, I'd like my son to help me with it. Thank you very much for sharing this with us! Wow! Congratulations on finishing this project! Once again, you did an amazing job. Yes, I will purchase the pattern. Will send you an email early next week, right now it's way too hot to even think about sewing, with this heatwave over here. Oh how you rock! Menagerie looks fantastic! Will the site where you are selling the pattern accept credit cards? DK's Wife: No, the site only accepts paypal. However, if you need to buy it with a credit card, let me know (email me) and I will set up a reserved listing in my etsy shop where you can use a credit card, and I will send you the link "manually" after payment to download the pattern in the usual way. Congratulations - what a project! Off to check out the pattern. Thanks, LiEr! Thanks! I will hop over to buy the pattern shortly! I like facutinsufragerie's idea of involving her son - I'll do the same with the grands! I think $24 is a steal of a deal. I'm getting this as a birthday gift to myself. I've been dying to make them and I predict a ton of gifts for my little people. C smith, I agree! Definitely a steal! When you consider all the work and hours put into it, and what you can do with it... certainly a steal! If people share with you what they create using this pattern could you share them with us? Id love to see other creations for the menagerie! brownieguideleader: Yes! 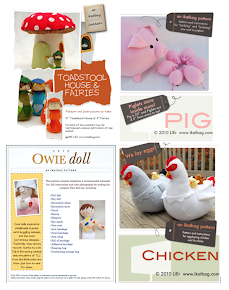 Am working on setting up a pinterest page to which we can pin our Menagerie projects! Will share soon. I'm overwhelmed! I don't know where to start! My fabric-on-hand isn't "proper" colors for anything. I guess a purple and blue kitty? I'm so indecisive but excited! I really can't find where to get the patterns. Help? I really can't find source where to get patterns. I'm blind? Help? Scroll down to find Menagerie. Congratulations and amazing work! really! it takes SO much time and effort. i make cardboard puppets and will like ti sell the patterns too. can you tell me what program you use to make your patterns digital?